Vegan Eats and Treats! : Apple Time! Our apple tree was planted by the people who lived here before us. When we first came to see the house, it was around this time of year. The realtor showed us the apple tree (it's planted in the weirdest place, behind our garage), and the ground below it was covered with rotting apples. In that moment, I passed some serious judgment on the people living here. Who cares if they had a toddler and were trying to sell their house (kidding! ... kinda)? 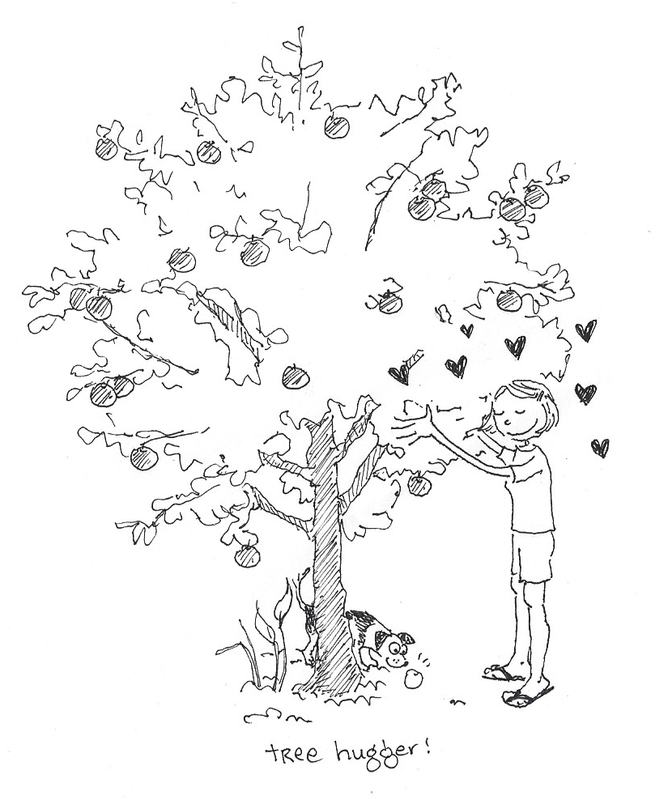 I have a moral philosophy about fruit trees - they are a gift from nature, and it is some kind of unpardonable sin to let too much of their fruit go unused. 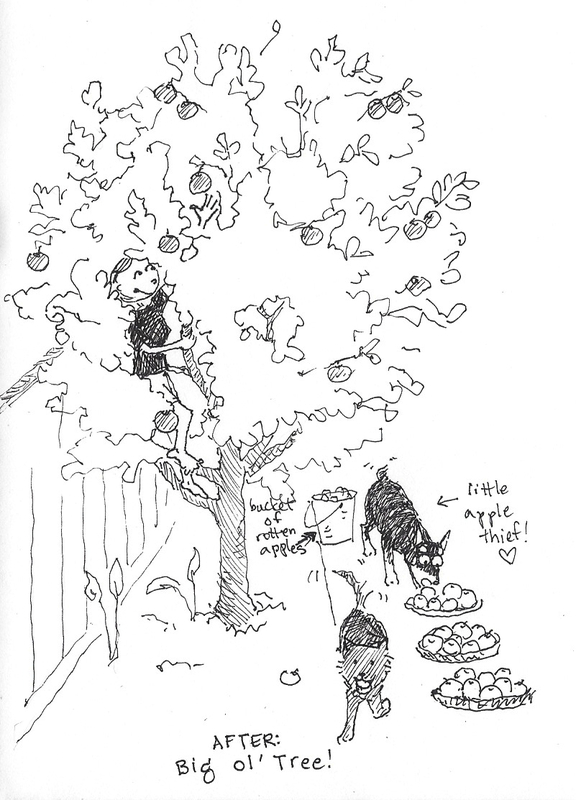 the doggies love it when I tend to the apple tree. The whole time I was up in the tree picking apples they were down below, absconding with apples! When I came down, I found 4-5 apples in the backyard, with little doggie nibbles out of them. Later, we even found an apple on the sofa. Ha ha. They look pretty cute trotting around with apples in their mouths. Every year, Apple Time arrives when it wants to arrive and for a few weekends and evenings I must sacrifice my free time and put it all toward the art of apple preservation. It's even more of a chore these days because our tree has grown a lot over the years. When we bought our house, I thought the tree was a dwarf variety, but time has proven otherwise. This year, our apples came much earlier than usual. Like, at least a month earlier. This is undoubtedly because of our long drought that we are having in California. Another unexpected development was that this year we had WAY MORE "perfect" apples with no bugs and no icky bits and no bird pecks in them. Usually there are a just a few of those, but this year there have been many... like at least 10x more than in years past. Could this be another result of the drought? Whatever the reason, it's great. 1. Perfect. Storable - no pecks or dents or worm holes or rotten bits. Nary a blemish in sight. 2. Almost perfect, but with a little dent. If you eat them soon, everything will be fine... but not storable. This also translates as "perfect enough for Amey, but not perfect enough for Mr. VE&T"
2. Imperfect but usable. Maybe these have buggie bits or a rotten spot, or a big dent on one side... but with a paring knife and some patience, enough of the apple is still good that it's worth my time. 4. Unsalvagable. These rotten, sickly, tiny bad apples go straight to the yard waste. Because we had so many more perfect apples than usual, I looked into how to store them. I carefully inspected them for any tiny damages or knicks that might lead to accelerated rotting. 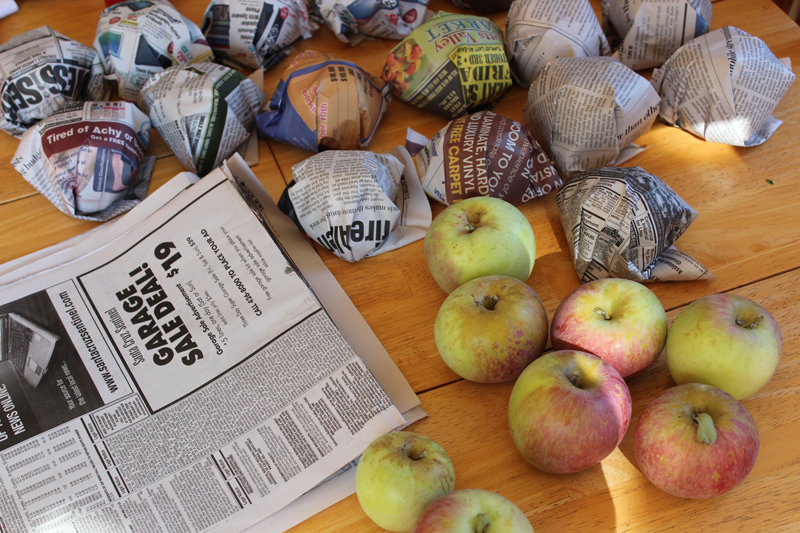 Those apples that passed the test were loving wrapped in half sheets of black and white newspaper. I read that it's better not to use the pages with colored ink. Some of my pages had colored ink, but I kept that part on the outside. 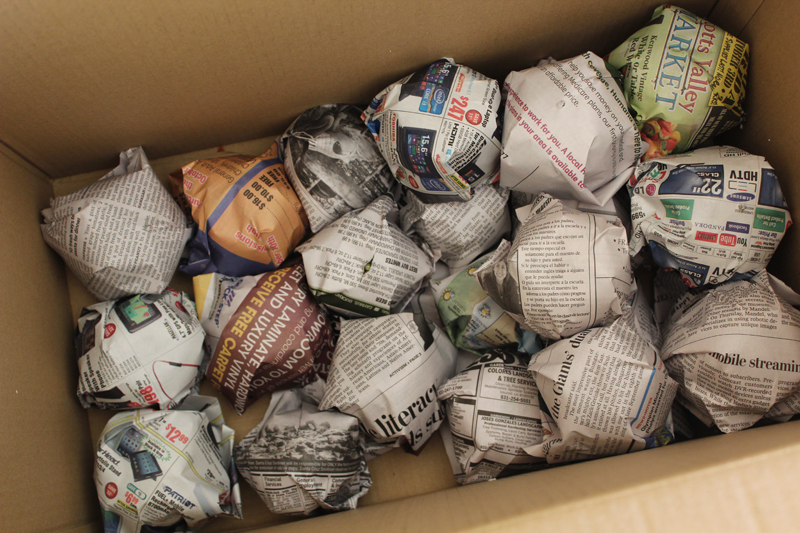 Then I put all the little love-wrapped apples into a box and have stored them in our garage - which stays quite cool. It's not as good as a walk-in refrigerator, but it'll do. Mr. VE&T really, really loves apples, but he is also slightly lazy and prudish. 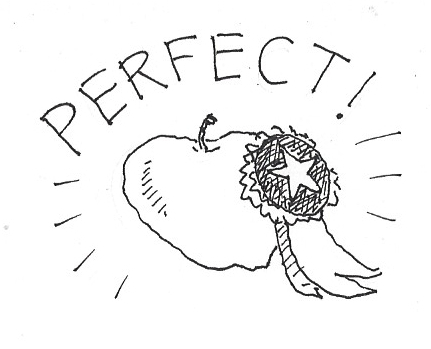 Only apples of the highest perfection levels will meet his standards. While I am happy to cut a little icky spot off an apple and eat the rest... this idea is completely prohibitive to Mr. VE&T. Instead of getting out the paring knife, he will drive all the way to the store and spend money on giant bags of store apples. I love the guy, but geez. Anyhow, this system has been perfect. Every few days, he goes out to the garage and unwraps a few more apples for himself. It's been great! These are the "imperfect but usable" apples. You can see the bug holes and spots... but also, you can see that there's a lot of good apple stuff going on there! 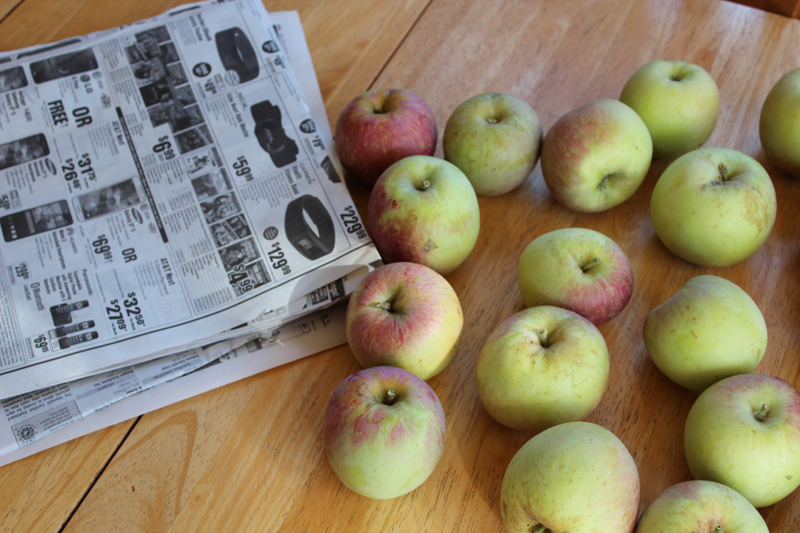 This is just a small sample of the many, many, many imperfect apples I've picked so far. I did one early picking, one giant picking, and I have at least one more big pick to go. The first thing I did was make some dried apples. I like them for snacks and also to give as holiday presents. I still don't have a dehydrator of my own, but every year I borrow one from my friends Toni & Scott. I put that Excalibur to use! I peeled, cored, trimmed and sliced SO MANY APPLES and filled all ten (or is it twelve?) trays of the dehydrator. 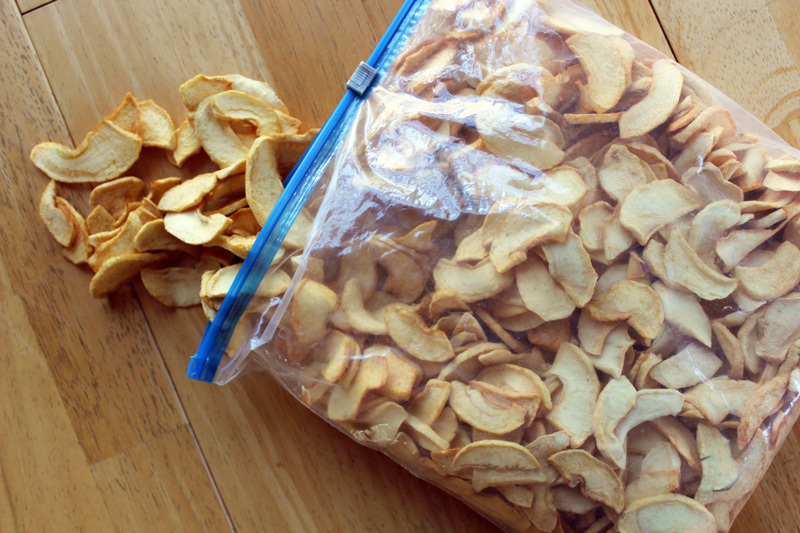 This large gallon bag of dried apples was the result. Yum! I also really love the way the house smells when I'm drying apples - the whole house is filled with the aroma of apples... it's magical! The second thing I did was make Applesauce! I love having homemade applesauce on hand! 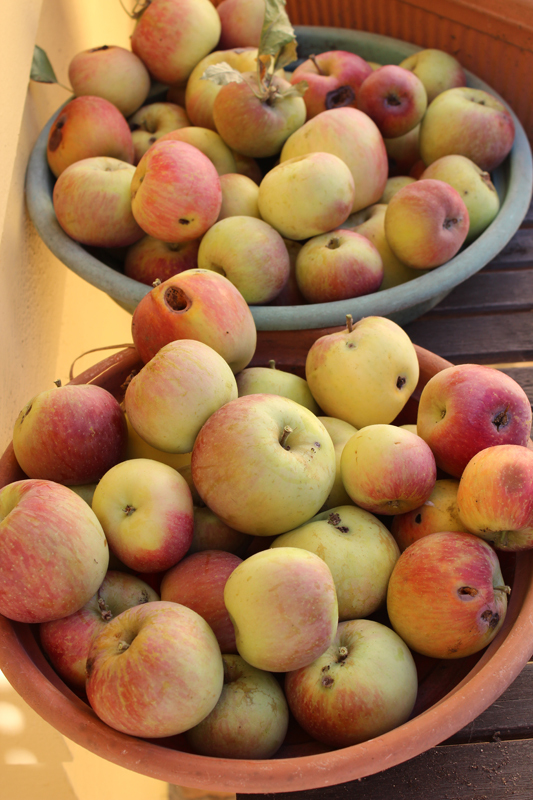 This weekend I made two GIANT batches - filling my biggest pot and my usual large pot with apples, two times over. Wowsers. In the past, I've always peeled the apples, but I recently learned* that you can leave the peels on, and then just run the applesauce through a food mill after it has cooked down. Using the food mill was still a little bit of work, but not nearly as much work as all that damned peeling... so I think I'll still with this technique from now on! I made the first batch all by myself, which took me at least two hours of just chopping - not to mention all the boiling and canning. But for the second batch of applesauce, I had helpers: my mom and dad! My dad is probably the biggest fan of our tree's super delicious apples and he loves our applesauce. So it was extra fun to have his help. And my mom has helped me many times in previous years with applesauce making, so she is already a pro. We had the football game on for my dad to watch, and we each had a big bowl of apples to cut and trim and it took us under an hour! Hoorah! It was such a fun way to spend the evening together! I hope they don't mind if I give them applesauce for Christmas, even though they helped make it. Ha ha. If you'd like to see details about how I cook and can my applesauce, there's an old post about it here, and another one here. It definitely takes some time, but it's not hard, and then you have applesauce when it's over! that's a lot of applesauce!! And this is just HALF of what I made. When all the boiling and food milling and canning and re-boiling of the canned jars was said and done, I was left with 23 medium jars and 12 of the smaller jars. I like having some of the smaller jars for the times when I just want a little applesauce for baking or whatever. But the medium jars make nicer Christmas presents and are better when I really want to munch on some serious applesauce!! Fortunately for us, our apple tree makes the most wonderfully delicious apples. I don't know how we got so lucky. Even with all the work involved, I wouldn't trade my apple tree for anything. I love it so much and I'm so grateful for the bounty it brings us year after year! Yay! I'm so jealous of your apple tree!!! I can't believe those previous homeowners let the apples go to waste!!! 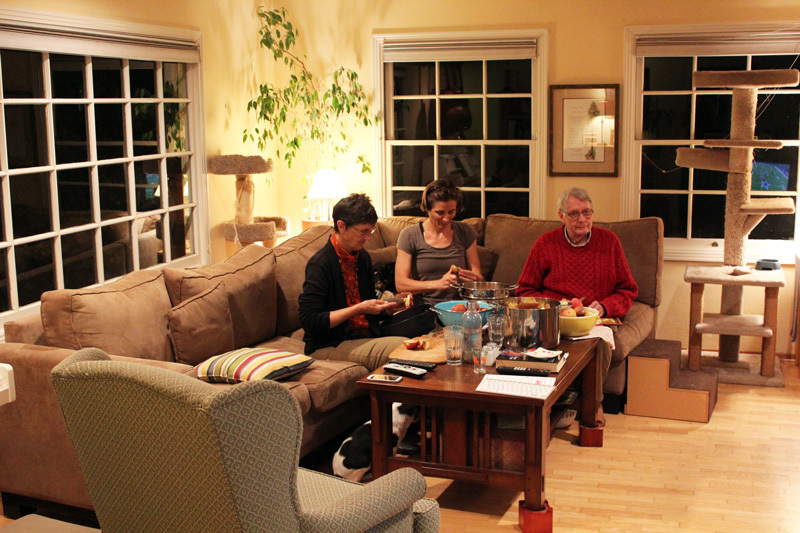 Also, I love that your parents came over and helped peel! That is so lucky!! I picked apples this year and it cost $25 bucks for a bag! I, too, made applesauce. I don't have food mill, but I do have an crank-powered apple peeler that is somehow incredibly gratifying to use. That is some serious applesauce production! I always love your apple posts. We went apple picking this year but did not have such a haul. We also go for the hay ride. Beautiful bounty! My dad planted an apple tree a couple of years ago and it is now starting to produce apples, though only a couple. Hopefully one day it becomes as bountiful as yours! They have an excalibur so could definitely make some dried treats. And all that apple sauce! Your tree must be HUGE! Holy moly, that's a lot of apples! They look so beautiful and delicious! 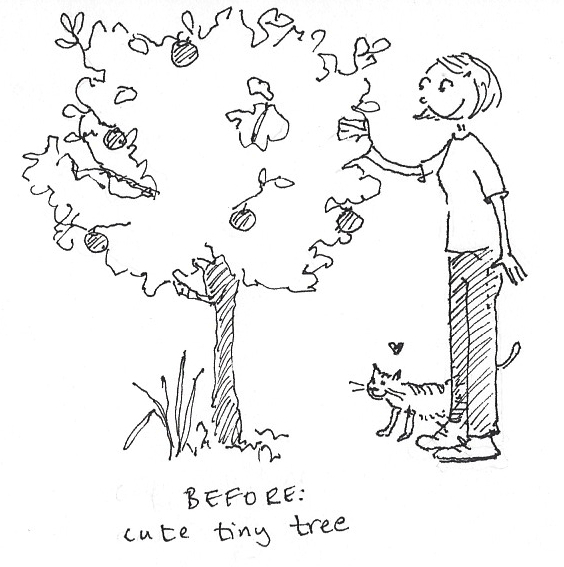 I was just lamenting the lack of nice apples at our local grocer the other day, and was trying to convince my parents, with their enormous backyard, to plant an apple tree (so far i've got them on the herb and veggie bandwagon, and even snuck a little baby tamarillo tree in the other day). Do you find that it needs much maintenance throughout the year, aside from the 'Apple Time' you mentioned?